I made my first gingerbread house this past Christmas. I am fifty-seven years old and had never made one, so I decided that would change. 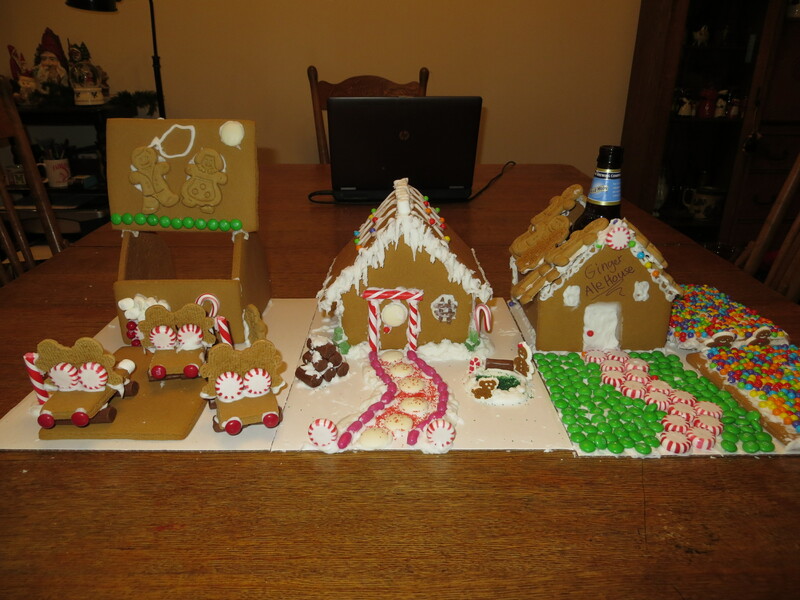 I informed my children, who are now 28 and 26, it is never to late to begin a tradition, and that when they came home from eastern Europe and New York City to stay with me over the holidays, we would be making gingerbread houses….beer included in the mix. 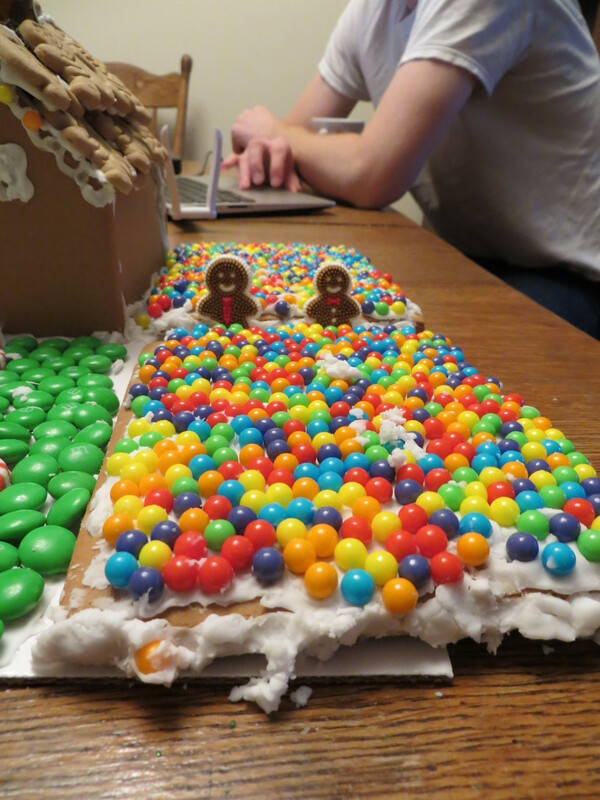 I have been researching gingerbread houses and even have a board on pinterest on the subject. 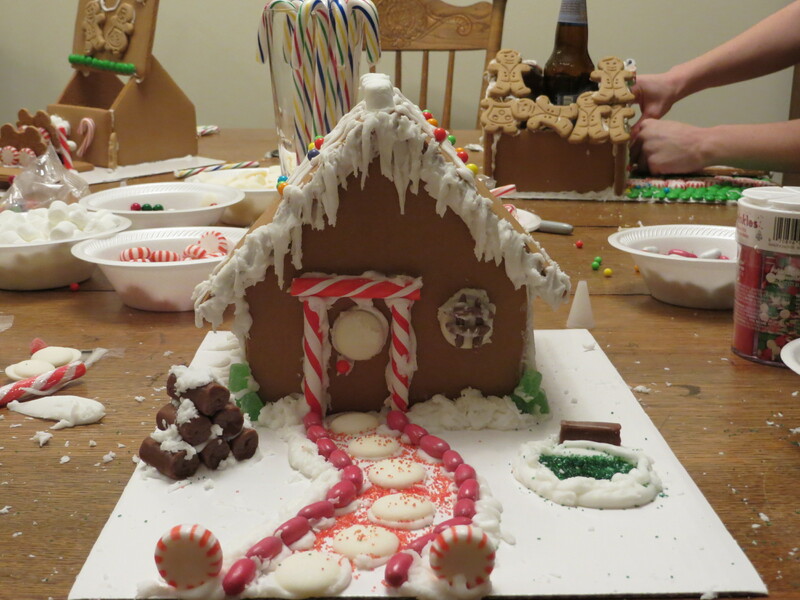 If I was going to create a gingerbread house, I really needed to know what the hell I was doing. I started by looking at recipes for creating the gingerbread walls and roof for the house and I thought to myself, “Oh, hell no.” No, this gingerbread house newbie was going to have to buy kits this first year. The thought of mixing and rolling and baking on top of my Christmas cookies and planned dinner was too much for me. So, I found kits at Walmart. 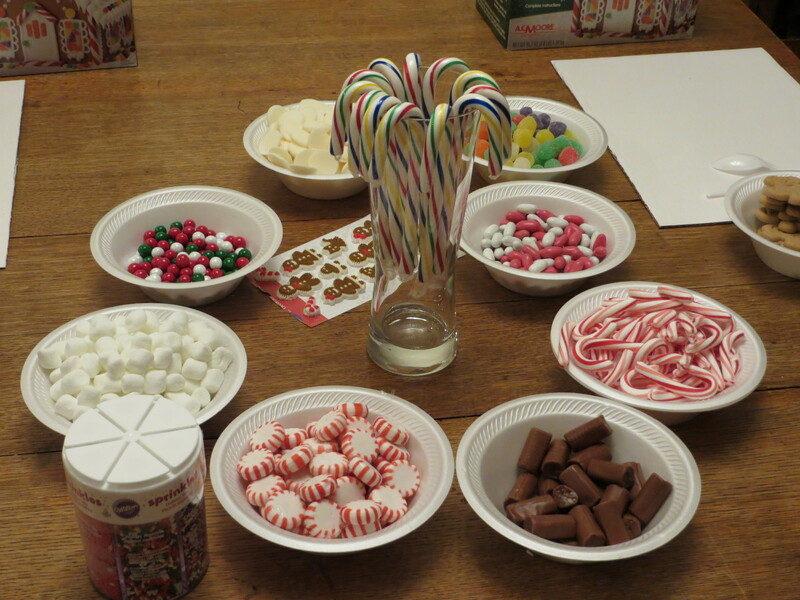 I also started accumulating candy and stuff to put on the gingerbread house. I bought other bases because I wanted to have room to make a yard. I was ready. 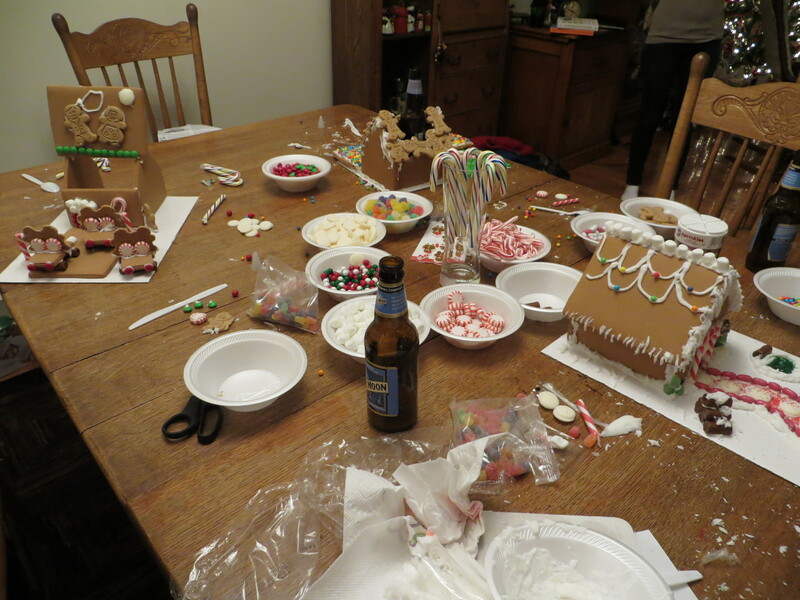 The best part of this was the fact that my kids, now grown, seemed to be excited to put together a gingerbread house. 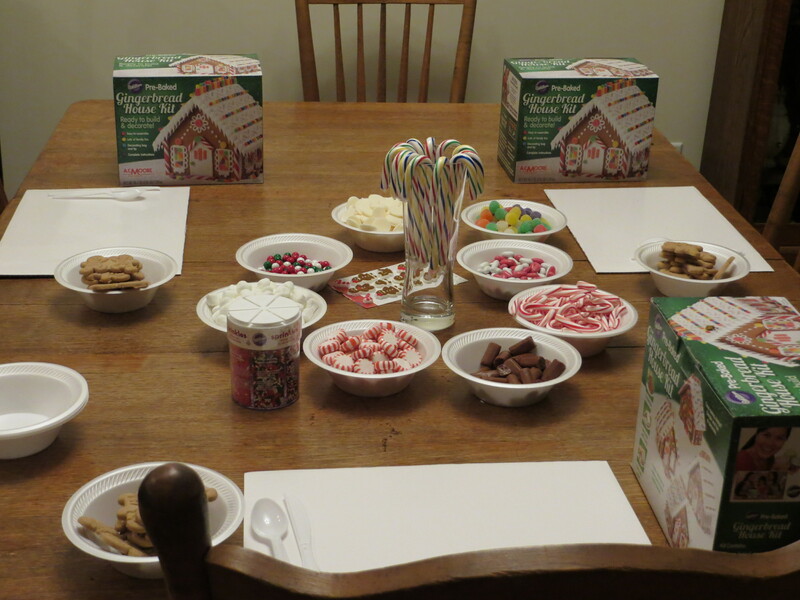 When they were small, I was so busy getting ready for a Christmas Eve sit- down dinner at our house for 25 people, baking cookies and cleaning, that I just never thought about gingerbread house building. It took us a while to get everything cooked and ready. I even used china and didn’t think about using plastic bowls or plates for salads or desserts until I was just tired of it all. So, our gingerbread house building I guess had to wait. My son has been living in the Republic of Georgia and already had plans to alter his gingerbread house. He was thinking of Georgian architecture and went to the kitchen and came back with a knife. He sat, studied, and then began manipulating his walls and roof. He was smiling, so I knew he came up with an idea. Alex, on the other hand, jumped right in and began icing her walls to the base. She remarked several times she was going to win. Before we started, we decided we would post our houses on my facebook wall and ask my friends to vote on the best gingerbread house. No one would know who built what house. Alex was on a mission to win. 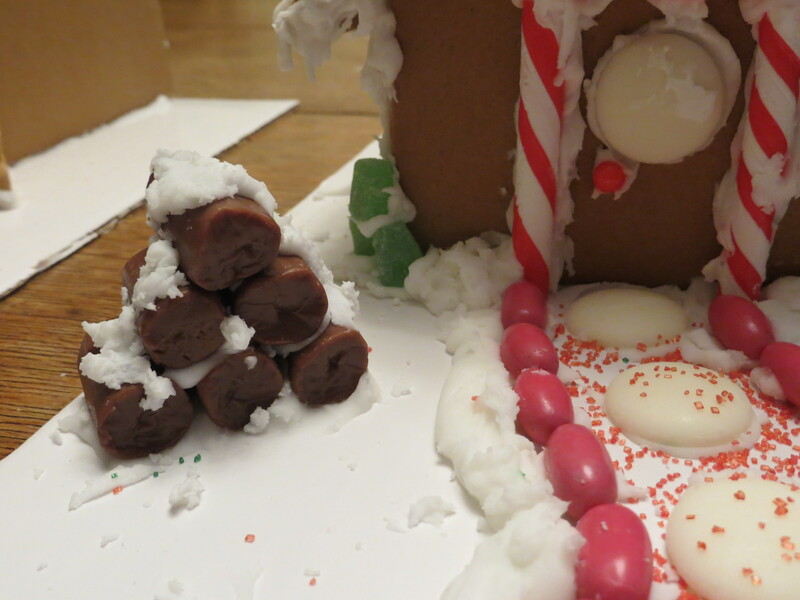 I, on the other hand, was dealt a blow when my gingerbread house was missing the icing bag. Really? Strike one on momma’s house. I tried to improvise by getting a zip lock bag and cutting a hole in one of the corners. Total fail. I made quite the mess. We had a lot of fun though. 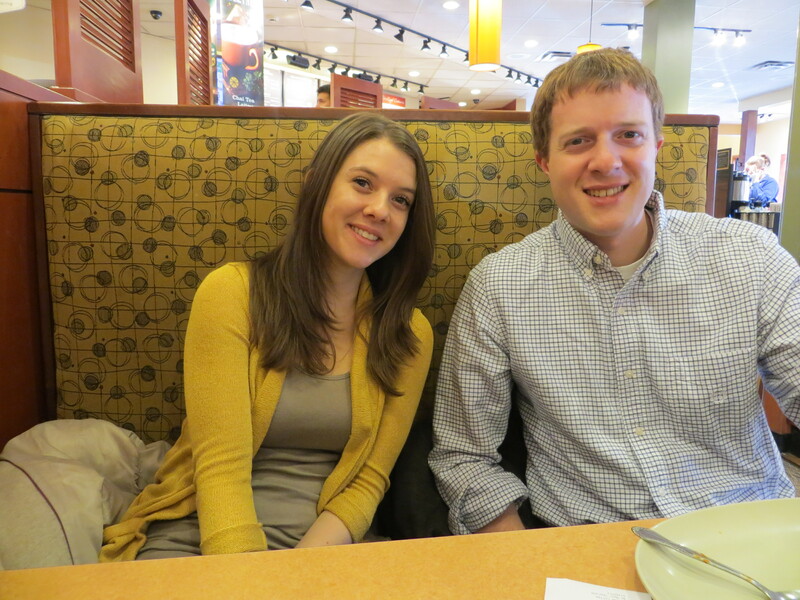 After Alex spent a lot of the time bragging about how her house was going to win, disaster struck….sort of. She put so many round little balls on her roof, that her roof slid right off the house. It was too heavy. She used a few choice curse words and then just sat and looked at her award winning gingerbread house. So, her roof became a side yard. 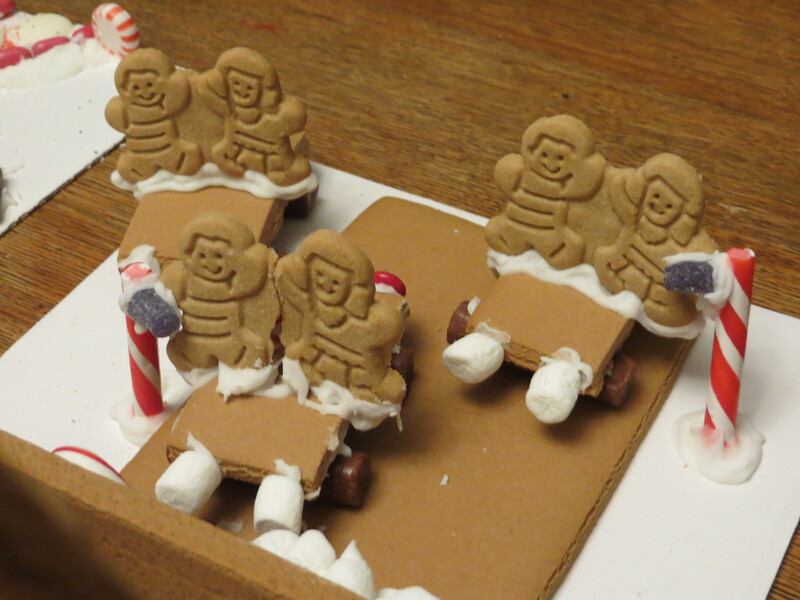 She exclaimed that she was done, but then grabbed a few gingerbread people and started icing them on as the roof. It left a hole in middle. 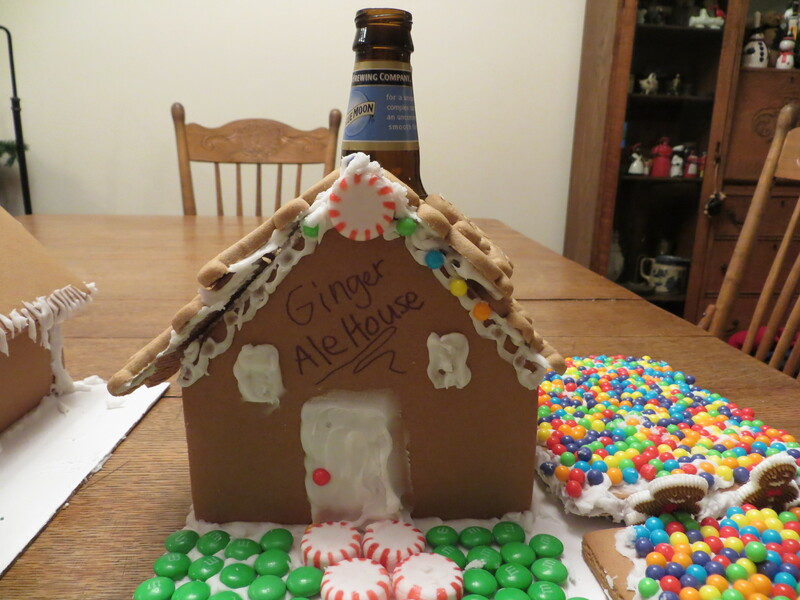 As she finished her bottle of Blue Moon beer, she placed it into the middle of her house and proclaimed her creation, “a ginger-ALE- house.” Way to recover, young grasshopper. Adam, meanwhile, changed the whole thing and created a drive-in. Yes, a drive-in movie theater. I was ready to start calling him Gingerbread Fred as he had pieces of gingerbread lying on the table with no direction in mind. And then it came to him. The result was creative and so very cute. I loved his result! It’s a Wonderful Life was even playing at the gingerbread drive-in and the scene where George tells Mary he would lasso the moon for her was on the screen. He had little cars with the speakers by the car and I just loved it. So, we were done. I was pretty proud of my first gingerbread house. It was a basic house, but I liked how I made the icicles. I also put tootsie rolls as logs. Now it was time for the judging. We cleaned off the messy table and lined up the contest entries. I then put it on Facebook, where my friends obliged and immediately began voting. People were also guessing who they thought each gingerbread house belonged to. Most of the people thought I made the drive-in, Alex made the cottage, and Adam made the beer hall. It was fun. 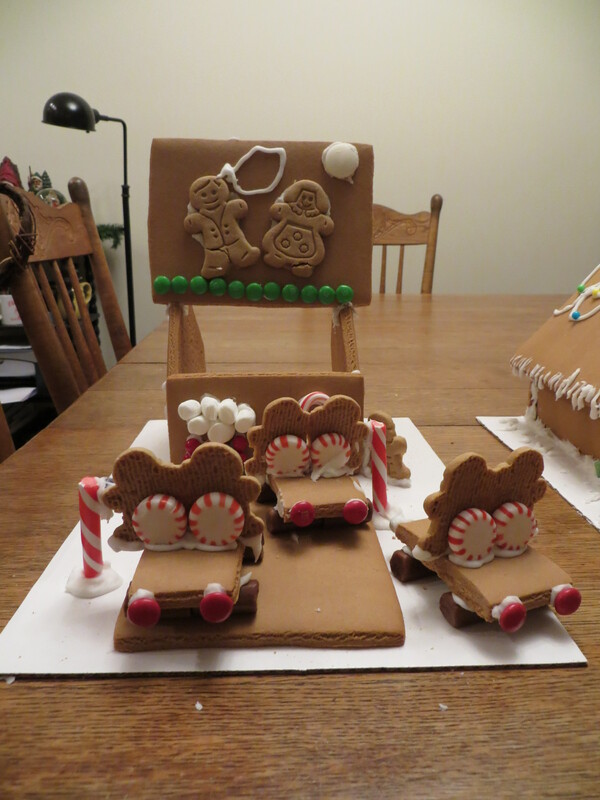 I won, of course, but as I got votes for “best workmanship,” the kids both received kudos for being creative. In the end, our first gingerbread house building was a success, minus my icing fiasco. I smiled when Adam said he wanted to do it again next year. Gingerbread Fred will be thinking ahead. Alex, on the other hand, will probably take a more modest approach and wait until her house is done before bragging. And I am just happy I had both of my children on the same continent, spending an evening with their mom making memories.